BAARX is one of several techniques used to ablate Barrett’s mucosa. Twenty four pH monitoring was used to assess the effect of acid control on the ablation technique in patients who had medical or surgical therapy for GERD. Seventeen consecutive patients with Barrett’s esophagus who underwent BAARX ablation between 2005 and 2007 were entered into a prospective, nonrandomized, unblinded, IRB approved study. All patients underwent upper endoscopy before ablation to confirm the presence of Barrett’s esophagus with or without dysplasia. Endoscopy was repeated at 3 months or at follow-up ablation if necessary. Manometry and BRAVO capsule pH monitoring was conducted at baseline, and at 3 months. The patients were divided into four groups and only patients with a 3 month follow-up pH monitoring were included for analysis, n = 9. Group 1 (G1) patients without antireflux operation n = 1, group 2 (G2) patients with a failed antireflux operation but successful medical control (PPI, H2-Blocker) n = 5, group 3 (G3) patients with failed antireflux operation and failed medical control n = 1, group 4 (G4) patients with competent antireflux surgery n = 2. The mean baseline DeMeester score for G1 was 27.3, for G2 = 3.74, for G3 = 30.7 and for G4 = 0.6. The average baseline lower esophageal sphincter pressure (LESP) for G1 was 9.3, for G2 = 2.64, for G3 = 2 and for G4 = 7.05. The mean DeMeester score after 3 month follow-up was 27.3 for G1, 1.1 for G2, 30.7 for G3 and 0.3 for G4. The mean number of ablative therapies was; G1 = 3, G2 = 2.4, G3 = 2, G4 = 2.5. One patient in G2 developed a stricture and has required dilations. To determine the effect of acid control we compared the numbers of procedures necessary for complete ablation G1 + G2 (acid control groups) vs. G3 + G4 (non acid control groups. Patients without acid suppression had an average of 3 ablation procedures while patients with acid control required 2.3 ablative treatments for complete response. The follow up for GI, G2, G3 and G4 was 12, 6.2, 4 and 6 months respectively. 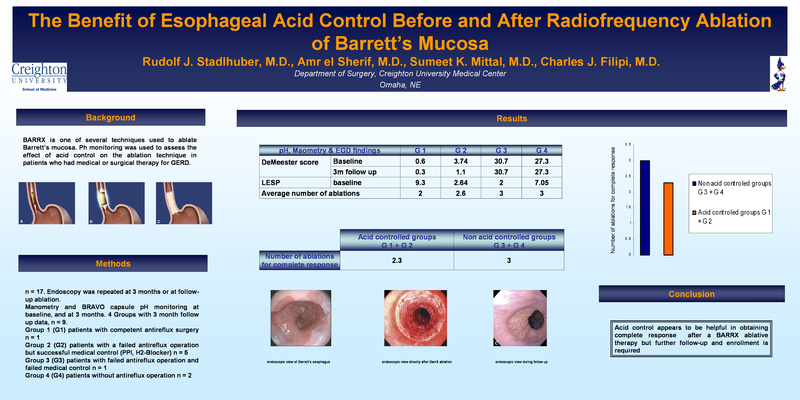 Acid control appears to be helpful in obtaining complete remission of Barrett’s mucosa after ablative therapy but further follow-up and enrollment is required.